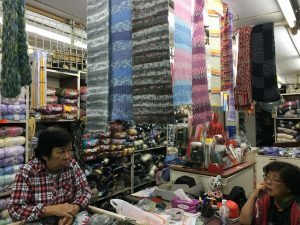 Since I have been on my travels from September 2016, I have not been able to buy any yarn (except in New Zealand), as the countries that I have visited so far, namely, Malaysia and Thailand are lacking in yarn shops. Lucky I brought along a stash of knitting yarn, enough to last a year I’m sure. So in the first week of January 2017 I was in Hong Kong for a week. 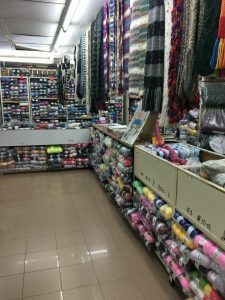 Now after doing some research online about knitting yarn stores in Hong Kong, I narrowed it down to one that I wanted to go and see. 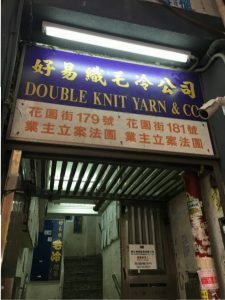 So walked down to Mong Kong in Kowloon from our hotel, about a 20 minute walk, only to find the right address for this knitting yarn store, but was disappointed to find an empty shop. Walked a few more blocks in and came across some markets and did see the following on a stall. As it was all acrylic, did not make a purchase, but did love the bright colours. Walking further down this street I came across a store called Double Knit Yarn & Co.
Was dying to go in, so went up these not so good looking stairs, about 2 flights and came across a large knitting yarn store. I was amazed. 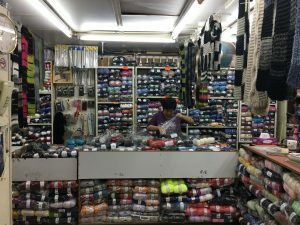 I asked the lady behind the counter if she had any sock yarn, but they only had dark colours, so did not make a purchase in this case. Took some photo’s though as looks like that they had a wide variety of every kind of wool/acrylic you could imagine. A rare find and well worth it, if you are need of supplies from a knitting yarn store whilst in Hong Kong. 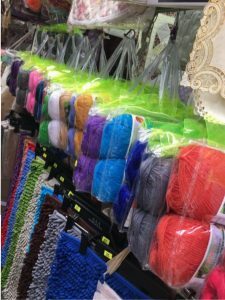 The address of this knitting yarn store is Double Knitting Yarn & Co, 179 Fa Yuen Street, Mongkok, Kowloon, Hong Kong. I first came across Woolswap whilst scrolling through my Instagram feed and I was immediately curious. I have participated in various swaps through Instagram, but never a wool one; and wool and all things woolly are my favourite! My whole experience of Woolswap has been fantastic; my partner was amazing and generous, and I got to do something I love - making a gift for someone else! Plus my partner sent me some yarns I haven't tried before, and now I love them and have learned a new skill! If you are unsure whether or not to give it a try, then let me reassure you. Woolswap is so well organised, so well thought out and SO MUCH FUN! If you love wool, love surprises, love making new friends, and love to give gifts - then this is the swap for you. I have loved it, and I will be participating again in future. Thanks for the woolly fun! I discovered Woolswap and it's by far my favorite swap. I joined because I love connecting with other knitters/crocheters and love to receive yarn and fun mail. I tried it out a few times before buying the annual membership and haven't been disappointed yet. Gayle who runs it is very quick to respond to questions and has made every round so much fun. It's fun to connect to stitchers who don't live nearby and enjoy the same passion. It's fun to make new friends all over the world! It's also fun to receive local goodies from their hometown. It's fun discovering new things. I recommend Woolswap to anyone who enjoys connecting with people & receiving fun mail.